If you’re starting up a marquee hire company you have to realise you’ll be working outdoors most of the time. And most of the time it’s very enjoyable – you get a suntan, fresh air (City marquees apart) and life is good. The flip side of this is you have to be prepared to put marquees up in all weathers. So when you start up a business and you’re drawing out costings don’t forget to include a decent set of waterproofs for you and anyone working with you. Ideally they’d have your logo on but don’t go spending silly money. hat – much to the amusement of some of my lads I’d often wear a hard hat in heavy rain. Why not? It’s got a natural gutter round the side so no dripping down your neck, it’s also raised off your head so you don’t get too hot. It just makes it look like you don’t trust your workmates lifting skills! This is on my mind as we’re out testing some marquee designs tomorrow and the forecast is awful, time to dust off my old marquee waterproofs (and maybe a hard hat). Thanks for reading – only 2 weeks to The Showmans Show. Posted in marquee hire advice, showmans show, starting out | Comments Off on But it’s raining..
How much room do you need for theatre style seating in a marquee? If a customer comes along and says they want to hold a ceremony in one of your marquees, how are you going to work out the size they need? Like most things to do with marquees it’s very easy, assuming you’re using standard chairs with no arms. Allow 50cm wide for the chair, and 1m depth for the chair and persons legs. In the photo above we used a 9m wide marquee with a 2m (fairly typical size) aisle down the middle. That leaves 3.5m each side, enough for 7 chairs. 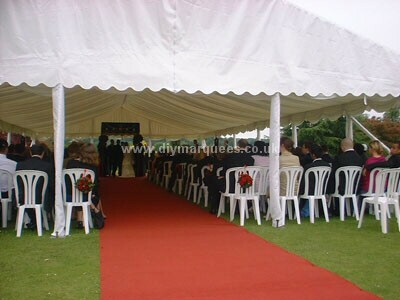 The marquee was 18m long and the front 2m was left clear for the ceremony. That leaves 16m for chairs – each row takes up 1m so 16 rows of 14 chairs = 224 chairs. Quite a few more than sitting around tables for example! If you’re a bit cramped for space try turning the layout round 90 degrees so the aisle comes in from the side. It doesn’t look as impressive but a shorter aisle means more space for seating. When you go out to see a customer as well as creating a good impression you obviously need to take a good look at where the marquee’s going. Ask the customer if there are any underground cables or pipes you should be aware of -if so have them clearly indicated on a diagram. If there aren’t any it’s worth mentioning at the bottom of your quote “you have indicated there are no underground pipes or cables to avoid when erecting the marquee”. As well as under the marquee you need to look above.  Are there any overhead power lines you need to worry about? Generally this is more likely when you’re putting a marquee up in a field rather than a garden but it should be taken seriously as this article from the BBC shows. Now don’t let stories such as this scare you, especially if you’re starting up a marquee hire business. It’s generally only on larger marquees and when you’re swinging 15ft+ poles around that you should be concerned but I’d always recommend contact EDF energy if there’s an overhead power cable nearby just to be sure. If you’re getting a bit concerned about the things you need to think of when you’re on a site visit (remember you’ve also got to sell a marquee and come up with suggested plans!) then don’t worry – it becomes second nature after a while and it’s worth having a checklist just to make sure. If I can find them I’ll post our old marquee site visit sheets up here to give you ideas. I’m away for the next 2 weeks so the factory will probably be more efficient but there won’t be any blog posts until I’m back, sorry.